I love my dogs, my family, and God, but not necessarily in that order. The first pet we got after having children was a Siamese cat. We named him Simba after the Lion King. Don’t be hating, all you non-cat people out there. We really wanted a dog, but with two small children a puppy seemed too much like a third child. Cats are pretty much self-sufficient, unlike children. You just need to give them food, water, and a clean litter box and you’re set. Puppies and children are much more demanding. A few years later, the kids had grown some, Simba was firmly established as “the family pet” and we were living in rural Virginia. On the front page of the daily paper was a story about several horses that had been confiscated from a local farm because of neglect. They were available for adoption from the ASPCA for much less than it would normally cost to buy a horse. My husband lived on a ranch for part of his teenage years and knows how to ride and care for horses. We thought it might be fun to get a horse and oh, what a bargain it was, and we packed up some carrots to go see the horses while the kids were at school. By the time we arrived at the ASPCA, we had talked ourselves out of getting a horse. The time involved, the cost of boarding, and what if we ever moved? (little did we know, we would be moving in less than 6 months) But since we were there, we fed the horses the carrots we brought, and then decided to just take a look at the dogs. There were adorable puppies of the alittlebitofeverything breed. There were mangy looking dogs. There were hyper dogs that did nothing but jump and bark every time you looked at them. And then there was this little golden retriever mix that just sat in her cage, cocked her head to one side and wagged her tail at me. Her name was Sadie, and I fell in love with her immediately. To my surprise, her cage was unlocked. So taking my life in my own hands, (insert sarcasm) I let myself in and started petting this skinny dog, whose fur was thin and coarse from malnutrition and her skin covered with dead fleas and sores. I was immediately reprimanded by an ASPCA worker for putting myself in such danger with this vicious golden retriever. I couldn’t help but laugh. The worker seemed more scary than this dog and I felt much safer inside the cage with Sadie rather than coming out to face the wrath of this woman. Sadie didn’t come home with us that day. My husband made arrangements to pick her up the next day and after stopping by a groomer to get the last of those dead fleas off, she has been ours for the past 11 years. About a year and a half ago, we had to put Simba, our cat to sleep because of kidney failure. It was left to me to take him to that fateful trip to the vet because my husband was out of town. I knew I was fond of Simba. We had him for 12 years, after all, but what I felt at the vet’s office that day shocked me. Seemingly out of nowhere, this pain came up from my gut and I began sobbing uncontrollably right there in front of the vet tech, who happened to be the vet’s son, who also happened to be one of our neighbors. I am a pretty reserved person usually, and I was embarrassed by my emotional outburst especially in front of this “kid” who used to trick or treat at my house. Then, Simba fell peacefully asleep in my arms, and they gently took him away from me forever. For the next few days, Simba’s loss knocked me for a loop that I had not expected. I love animals, but I don’t consider it to be the same kind of love I feel for people and for my family. But the pain was such that I decided that I never wanted to go through that again. 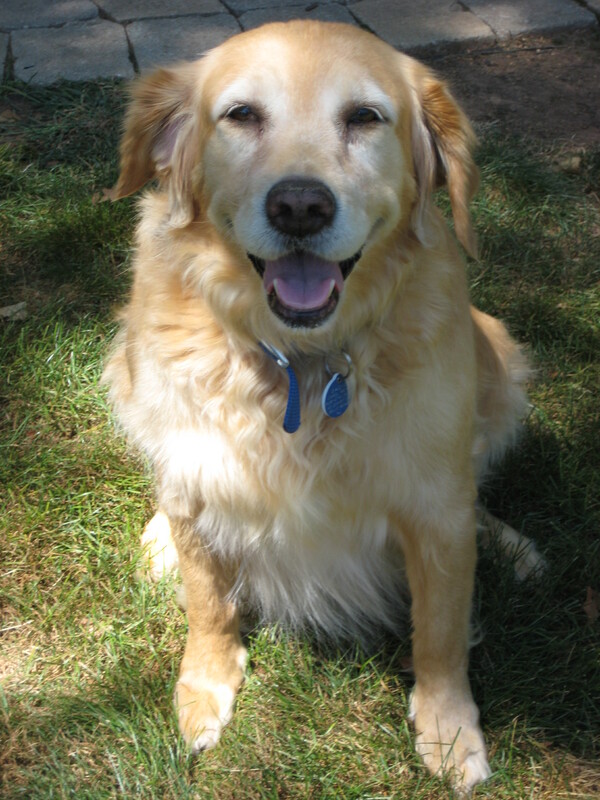 Once Sadie, our golden retriever passed away, that would be it. Why would I want to choose to go through that kind of pain again? I discussed this with my husband who is much more practical than I and also much less of an animal lover. He agreed. In fact, he figured out that the timing of Sadie’s passing would probably be around the same time our youngest child would be graduating from high school and then we would be totally free. He found the thought liberating. I found it depressing. That August our son, our oldest child, left for college. Dropping him off was a day I had long been dreading. If I had to put my feelings into one word it would be mourning. I was mourning his leaving our nest. I was mourning the hole it would leave in our home and in my heart. I knew life would never be the same again. And it hasn’t. Not necessarily a bad thing, just different. And in the weeks that followed his leaving, my poor husband didn’t know what to do with me. My sweet mother-in-law (who had 5 children up and leave her nest) told him I was normal and to be patient with me. His administrative assistant at work, who also has grown children told him the same. Yet, being a man, he felt the need to “fix” me it. One day, he was at his buddy’s house getting ready to go on a bike ride. This friend’s wife, Anne, runs an animal shelter. On any given day, they will have up to 40 dogs in their heated barn available for adoption. As Hubby was fiddling around with his bike, getting ready to go, one of the little dogs came out of the barn and started following Hubs around, wagging his tail and looking extremely cute. He commented to his friend, “Carol would just love that dog.” And to make an already too long story short, two days later, Hubby brought this little guy came home to me as a surprise. This from the man who was looking forward to freedom from kids and pets in just a few short years. 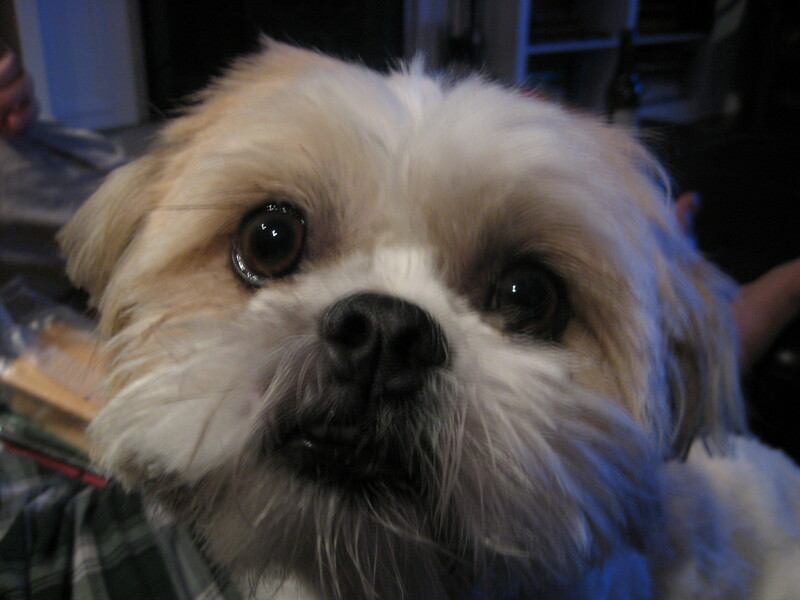 He had just made a 10-15 year commitment to a little shih-tzu that we named Kobi. Looking back over the last year and two months that we’ve had Kobi, I really see him as a gift from God. I have written in the past about a crisis our family is going through. I still can’t say much about it, but I can tell you it has nothing to do with our son leaving for college, which was the impetus for my husband to get me this dog. Through this crisis God has used the antics and affection of this little dog to make us smile when some days I felt there was not much to smile about. God has used Kobi to keep our hearts soft and loving. I can’t explain it any better than that. I believe it was God who put the thought in my husband’s heart to get us this dog. We had literally just talked the day before Hubs met Kobi about the trips we would take once we were kid/pet free in a few years. There is no other way to explain my husband’s change of heart. Thank you, Lord, for all your good and perfect gifts, especially the ones with big brown eyes wrapped in fur. This entry was posted on November 6, 2008 at 1:39 pm	and is filed under pets. Tagged: ASPCA, dogs, Golden Retriever, pets, shih-tzu, Siamese cats. You can follow any responses to this entry through the RSS 2.0 feed. Both comments and pings are currently closed. I have to thank you so much for posting this story. I believe God knew I needed to read this story. I am an animal lover and we have 4 dogs (3 are puppy mill rescues) and I love them all, and reading about your dogs was very sweet. But what touched me the most about your story is the part about feeling like you were in mourning after your son went off to college. My twin girls just went off to College in September, and I feel as though I’m grieving…like I’m in mourning for what is gone and will never be the same. My poor husband is worried that I’m losing it, because I cry at least a little bit almost every single day. Today has been especially hard because one of my daughters called and said she’s decided to do a double major and therefore, she’ll have to go to school year round. That means she won’t be home for summer, which is what I have been looking forward to.It’s nice to hear someone else has gone through these feelings. It’s nice to know that I’m not abnormal, and it’s nice to know it will get better. Thank you so much! God bless! Our beautiful Doberman, Casey, is close to 9 years old. It’s my understanding that the average life span of a Dobie is 9 years old. Casey’s pretty white around the mush now, walks a little slower, and spends lots of time just laying in her dog bed upstairs, and she doesn’t bound down the steps to greet us when we come home anymore. I love her dearly and she was my constant companion on days my chemo treatments knocked me on my behind. I often wonder how I’m going to deal with perhaps having to put her down, as you had to with Simba, or just coming home one day and finding she’s left this world. She’s a member of the family and I know I’ll miss her like crazy. Anyway, I’ve stopped crying now. Thanks for sharing your story, Carol. Sweet post and you are doing a great job with photos. These 2 are precious. NaBloPoMo mastery here we come! What a great post, Carol! We have a siamese (I’ve had since before Hubby came along), and for as much as she drives us crazy, I know I’ll be very sad when she passes. We had lots of pets growing up and I know that for a child to have a pet is a great learning experience. I’m so glad you have Kobi now too. And whoever says that our pets won’t be in heaven with us is just crazy. Look in those cute eyes and tell me that God doesn’t love that creature too. I understand the gut wrenching sobs. We had to put down our dog of 12 years. She was my pal, but we had no choice and it tore our hearts out. My husband can’t deal with the loss again and so no more dogs for us. Our daughter went to college this year, and maybe our son in two years. I think you’re lucky to find this new pal for your family.